The human pinky may be an incredibly small body part, but an injury there could bring your daily life to a halt. 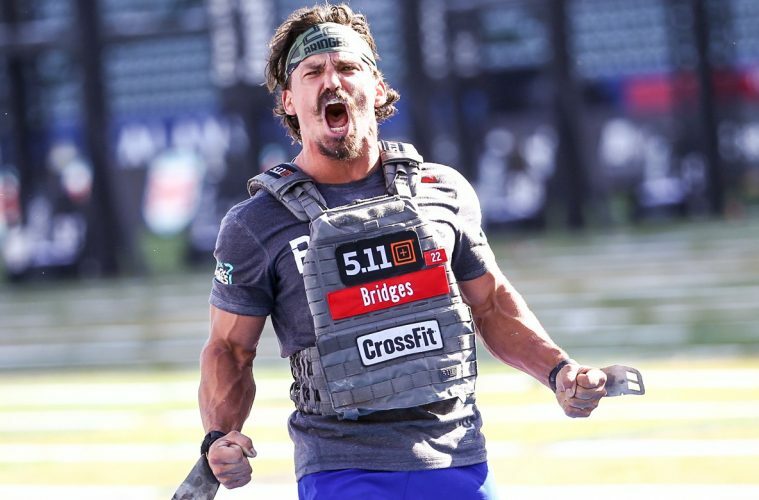 If you’re an athlete, forget about playing tennis, golfing, or basketball. Not an athlete? Well, activities like typing, lifting weights, or even eating soup suddenly become painful beyond belief. If you’ve suffered a pinky injury like a finger sprain, you are well aware of how disruptive this injury can be. You probably want to get back to your daily life — pain-free and able to do simple tasks without wincing in pain. The BestHealthGear team definitely recommends purchasing a finger brace. Finger braces are great because they hold your finger in place, which helps promote the healing process while preventing hyperextensions and further injury. Below, please find our list of the best pinky finger splints on the market. What are the Most Common Finger Injuries? Fits Any Finger – The Vive Trigger Finger Splint can fit any finger on your right or left hand, including either thumb. As you wear the finger splint, it helps alleviate any feelings of stiffness that you’re experiencing in the finger wearing it. This could be your thumb, pinky finger, ring finger, middle finger, or index finger. The splint features a finger strap which can be used to firmly fasten it to the finger. In addition, you can use the lower finger strap for more firmness as well as the wrist strap (which is removable). The splint is fully adjustable, thanks to the D-ring that it is designed with. Fingers that are as wide as 3.5 inches are compatible with the splint. The circumference of the wrist can be up to 10 inches. Alleviates Trigger Finger – This full finger splint will give relief to your trigger finger, also known as stenosing. Your wrist and other fingers will remain free and unimpeded, so it won’t be difficult to do your normal everyday activities while wearing the splint. It gives all its support to the finger that wears it. The joint in the finger won’t lock up and stiffness will be greatly reduced. If you’ve suffered a sprain or fracture, then this sprint can help a lot with the pain and stiffness in a particular finger. Aluminum Assistance Included – An aluminum brace is integrated with the splint to provide strong support for your finger. 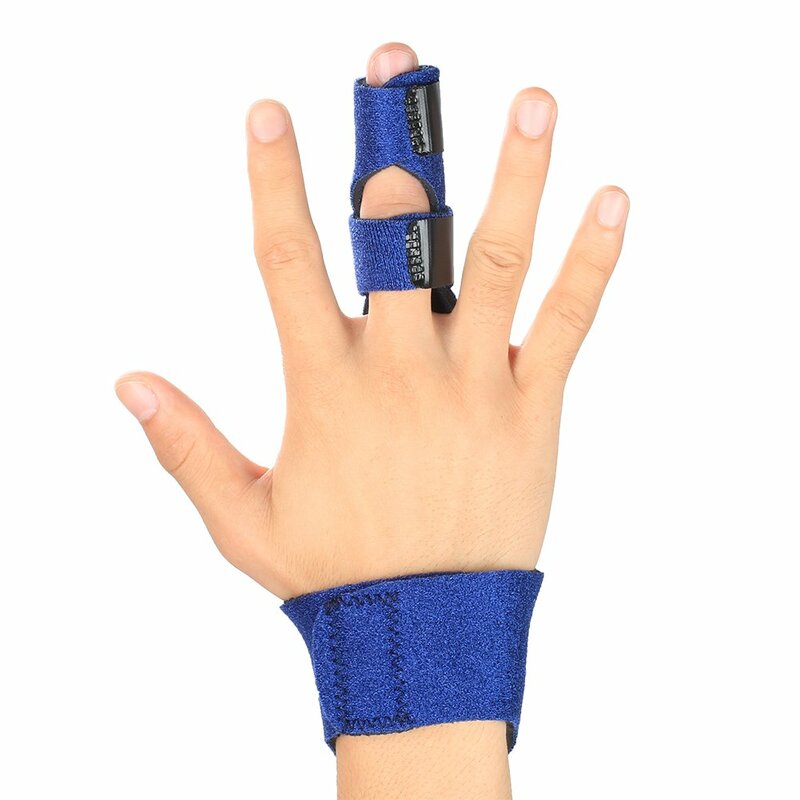 The brace is about 6.25 inches long and it secures the affected finger in place so that it is totally restrained. That way, the joint and tendons can heal without worrying about disturbing them. You won’t feel as much discomfort and pain either. Comfortable & Lightweight – The trigger finger splint is made from neoprene blend material which is breathable and lightweight. You can wear this splint all day and night and it will stay comfortable on your finger. In fact, the splint contains a small amount of padding which helps keep your finger comfortable while absorbing moisture and sweat. 60-Day Guarantee – Purchase with the peace of mind of knowing that you get a 60-day guarantee with no conditions whatsoever. The MedicHelp pinky splint is perfect for anyone trying to heal most major finger injuries: dislocations, sprains, and breaks. This brace is very effective at supporting finger recovery. It holds the pinky in a straight position and prevents movement by anchoring itself at the wearer’s wrist. This brace also works well for minor injuries like knuckle sprains, arthritis, and tendinitis. Breathable and Comfortable – The premium quality fabrics of this hand brace/finger splint are breathable for the skin. They’re also durable enough to endure a lot of resistance and heavy usage. When you put on the brace, you can go about your normal daily activities and experience fewer pains and aches in your finger. The lightweight design of the brace makes it easy to wear all day and night. Quality Hook and Loops – There are three hook and loop fasteners which come with this brace. They are durable and good quality fasteners which stay on securely and can last for a long time. Adjustable – The splint brace features an ergonomic metal bar which makes it easy and comfortable to wear. It can be worn on the outside or inside of your palm and finger. If it feels too tight or too loose, you can adjust the brace to fit more comfortably to your hand. Finger Stabilization – The brace doesn’t just alleviate discomfort and pains in your hand, it also provides stabilization and restraint to your finger joints as well. 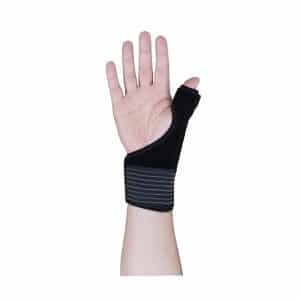 This is suitable for anyone who’s sprained their knuckles, fractured their fingers, or has developed tendonitis or rheumatoid arthritis. Of course, you should always seek professional medical care and rehabilitation for serious conditions like these too. Money Back Guarantee – Customer satisfaction is guaranteed or your money back. This means you can get a refund if you dislike the product or have trouble with it. 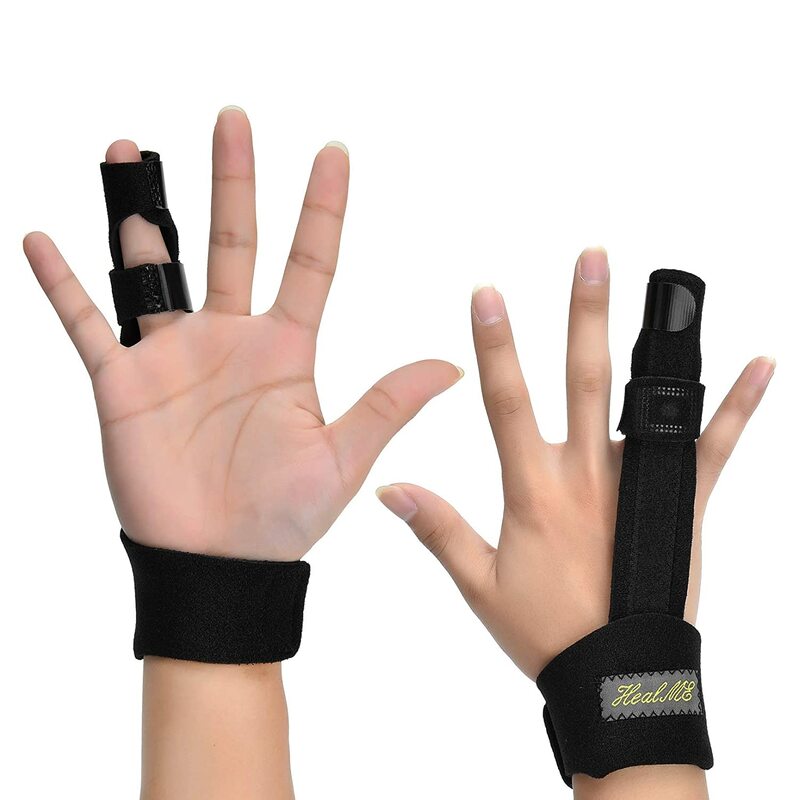 Fits Any Finger – This a universal splint finger brace which can go on any finger of any hand. As long as the perimeter of the finger is no more than 3.5 inches and the perimeter of the wrist is no more than 10 inches, this brace will fit fine. Total Protection – The brace is designed to protect the hand and finger while restraining and straightening all the knuckles of the hand. 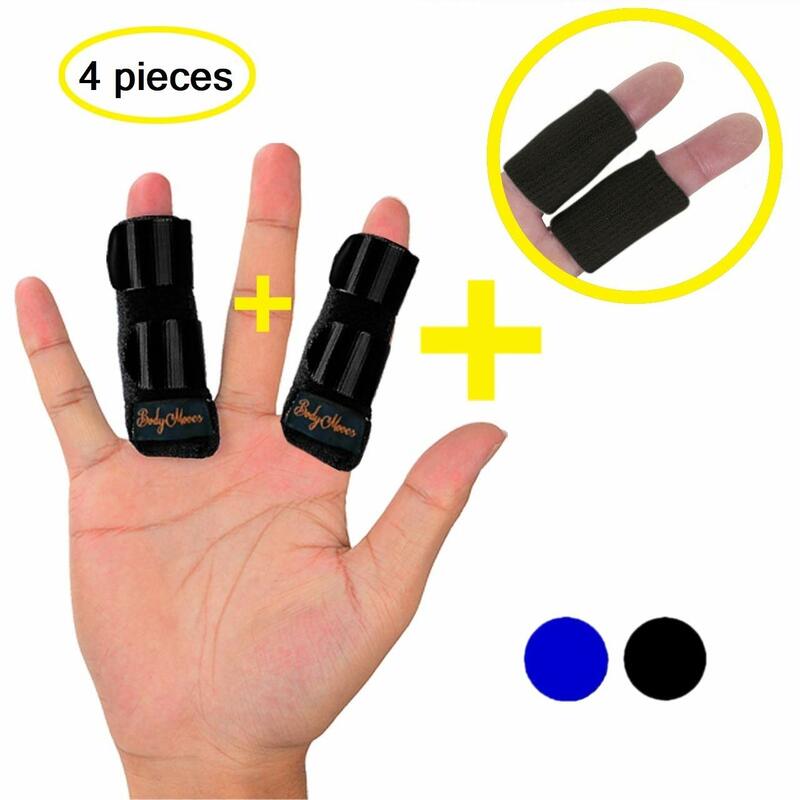 It is suitable to wear on your mallet finger, trigger finger, fractured finger, broken finger, rheumatoid arthritis, sprained knuckles, pain relief of the finger, and more. Very Comfortable – The brace is made from flexible aluminum material which is both protective and comforting to your finger at the same time. It is able to bend and conform to your finger’s shape and size. Your skin will touch against the best quality closed cell neoprene material, cotton fabric, and stretch nylon. Patent Filed – The brace has an original design which is patented by the Quanquer brand. Its fastener tapers are adjustable on the fingers and wrist, making it fast and easy to apply for strong finger support. You can take off the middle fastener straps if that is your preference. There is total originality in the creation of this design. Warranty and Returns – Quanquer offers a 30-day money-back guarantee on every purchase. So, if you don’t like the brace within 30 days of purchasing it, you can return it for a full refund. Once the 30 days has expired, you have a 1-year warranty against any existing manufacturing defects in the brace. This allows you to exchange the faulty brace for another one free of charge within this first year. Can Fit Any Finger – This trigger finger splint is universal, which means that you can wear it on any finger of your right or left hand. This includes your pinky finger, ring finger, index finger, middle finger, or thumb. There are additional fastening tape and an adjustable fastener to ensure that it fits the width of your desired finger perfectly. 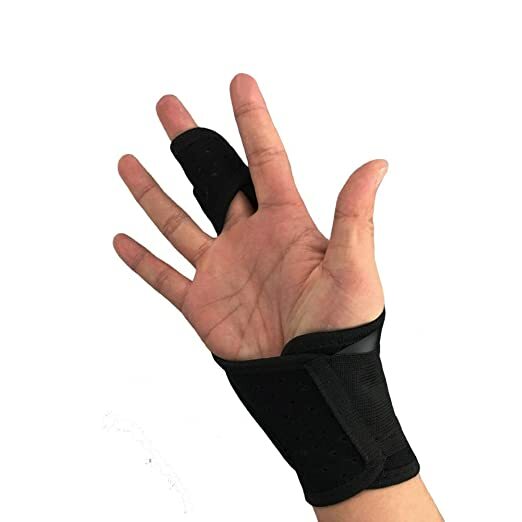 Alleviates Finger Pain – This splint brace can effectively reduce various symptoms felt in the finger, such as stiffness, soreness, swelling, locking, and popping. After the brace is applied to the finger, it will restrict its bendability so that the finger joint does not lock up. Durable Lightweight Aluminum – The aluminum used to make this finger splint brace is durable and lightweight. Its high-quality neoprene material is breathable against the skin and covered with cotton fabric and stretch nylon. This mixture of materials is designed perfectly to alleviate discomfort and pain in the finger. Additional Adjustable Tape Available – You will have additional fastening tape included with your finger splint brace. Your knuckle splint movement is constrained while being securely supported. This reduces the chances of you needing surgery because it allows your trigger finger to recover a lot faster. 60-Day Moneyback Guarantee – If you don’t like the brace for any reason, you can return it for a full refund within the first 60 days of purchasing it. If you keep the brace after 60 days and you notice a manufacturing defect, you have up to 1 year after these 60 days to request a full replacement of the brace for free. Contact us if you have any questions or concerns. We will respond within 24 hours. Cloth Material – Its cloth material is breathable and helps boost blood circulation to areas of the finger where there’s less perspiration. You can fit the brace on any finger. 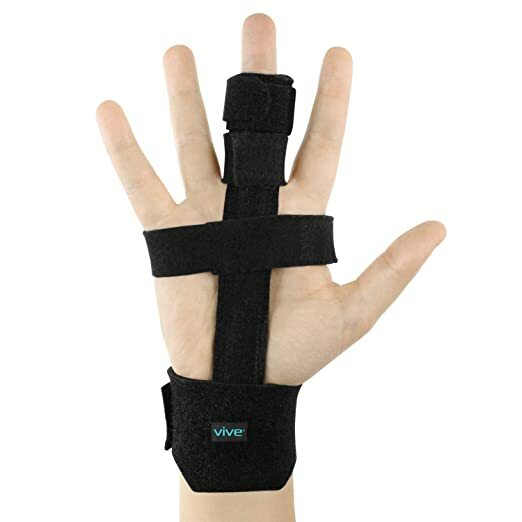 Great Added Support – The brace gives you the added support that you need to manage your carpel tunnel, strains, sprains, stress injury, or arthritis. Easy Fit – It has an adjustable Velcro design which fits most people’s fingers, regardless of which hand the finger is on. Adjustable Compression – If you’ve gone through surgery or an injury, the brace has adjustable compression which can alleviate inflammation and pain in the finger. Medical Stabilizer – The brace can restrain any sprain finger, fractured knuckle, or crooked finger. This is a top finger splint that is versatile, effective, and inexpensive. Find out a little more below. The finger splint is great at preventing injuries, especially while you’re playing sports. It protects you from dislocations, injuries to the tendon, jams, and breaks in the finger area. Overall, you can expect to reduce the symptoms of stiffness, soreness, swelling, bending, finger locking, and popping. Better Sports Performance – The finger splint gives the finger the protection and assistance it needs to heal faster. Due to its light compression quality, it boosts blood circulation to the finger. This will help you grip balls better if you’re playing sports like basketball or baseball. Adjustable – Firm Velcro straps are included which can easily be adjusted and worn. Anyone can wear this finger splint, including senior citizens, children, and adults. It fits on any finger with a circumference of no more than 3.5 inches. Comfortable and Lightweight – The finger splint is made from lightweight, high-quality neoprene that is breathable for the skin. The soft cotton and stretchy nylon material give you additional comfort while keeping your hand temperature cool. Since it is small, it is easy to take with you when you travel. The severity of a fractured finger can vary in size and shape. Sometimes it may be a minor fracture that needs a little treatment. But if it is more severe, you’ll need surgical treatment. If you fracture your finger, you should have a doctor diagnose it. That way, you can be given an appropriate treatment plan. We all depend on our fingers to move in different ways to perform activities like tying shoes, eating, playing the piano, and typing. If you want to do any of these activities properly again, it is best to have a doctor evaluate your fracture so that you can go back to doing them as quickly as possible. There is a condition called “trigger finger” where a finger snaps in the palm and is not able to get out of there. A lot of people experience this in the morning. When you go to straighten the finger out, it will be extremely painful. 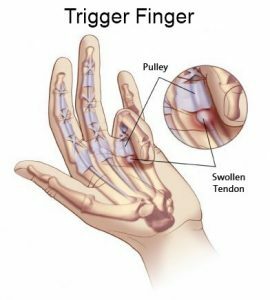 You can experience trigger finger in any of your fingers. Fortunately, each treatment that was talked about can be used for any finger that has triggering. Roughly 75% of women can get trigger fingers, which is much more often than men. Trigger finger does not threaten your life, but it is painful and will interfere with your attempts to perform daily activities. Sometimes, the pain will eventually go away on its own. If it doesn’t and you cannot live with it anymore, then you need to ask a doctor for a treatment plan. There is a certain kind of dislocated thumb called the “Gamekeeper’s thumb.” This is where the thumb’s ulnar collateral ligament gets damaged, which doesn’t allow you to point your thumb that far from the rest of the hand. When you injure your ligament in this way, it usually needs surgery. The name of the injury is actually a hunting term. It doesn’t have anything to do with soccer, despite popular belief. When your finger incurs some kind of physical impact, it becomes a sprained finger. 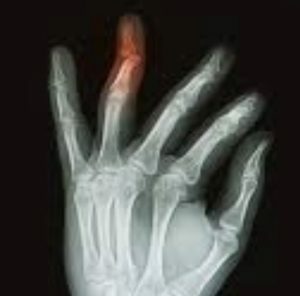 This could happen if the end of your finger receives a hit or blow to it. This can affect the joint by hyperextending it. The ligaments become torn or stretched as a result. Jammed fingers can happen when either performing regular activities or playing sports. Sometimes a jammed finger may be functional and appear fine, but it will still need medical treatment. A lot of finger injuries are complicated and if they’re not treated soon enough, they can cause permanent issues with the finger. 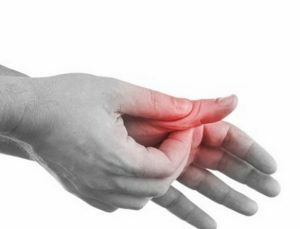 When a finger gets compressed from the top toward the hand area, it causes a sprain or stretch of the ligaments which provide joint support. This is called a jammed finger. Remember that ligaments keep bone attached to other bone. The stronger the compression, the worse the sprain.